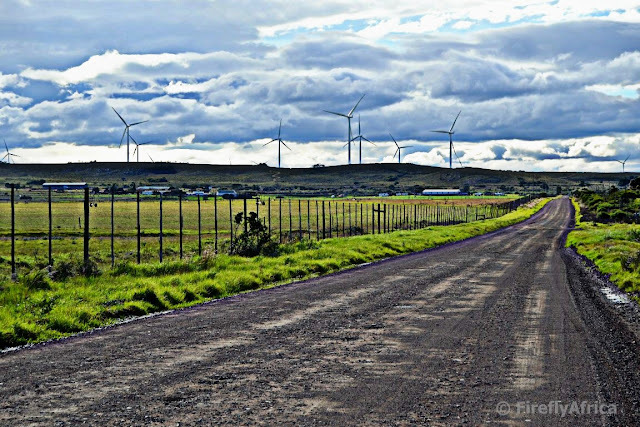 Love them or hate them, the wind farms around Jeffrey's Bay, Humansdorp and St Francis has become part of the Kouga region's landscape. After a meeting in Humansdorp recently I did a detour to Paradise Beach along the road that leads through Lombardini Game Farm and stopped to snap this pic back on the road. 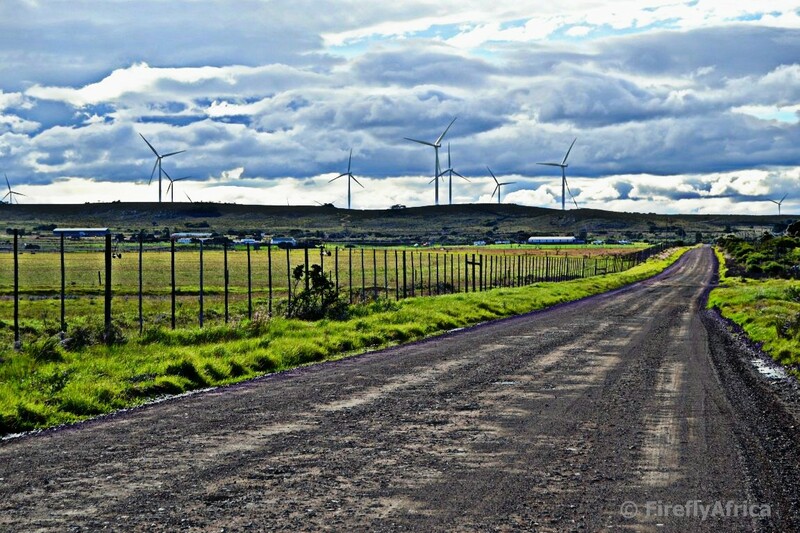 What's your feeling about the wind farms becoming such prominent landmarks on the landscape? Driving through the Karoo from the interior to the Eastern or Southern Cape coast (or the other way around) and looking for a spot to sleep over? The Karoo Heartland has some excellent overnighting spots in towns like Cradock, Graaff-Reinet, Nieu-Bethesda and Somerset East. If Cradock is your overnight destination of choice then you really don't need to look any further than the iconic Tuishuise and Victoria Manor Hotel. 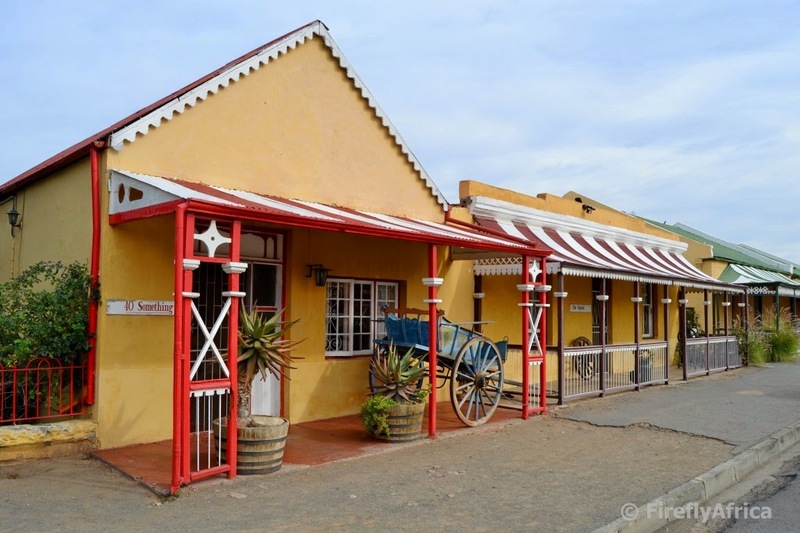 Die Tuishuise on Market Street in Cradock is made up of 30 beautifully restored Karoo style cottages. These cottages date back to the 1840's and are all furnished with antique furniture yet also includes all the modern amenities travelers require. 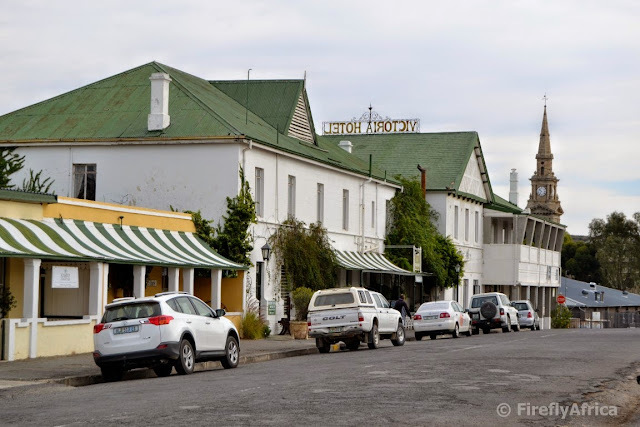 The Victoria Manor Hotel at the top of the street is one of the oldest hotels in South Africa and was built in 1848. 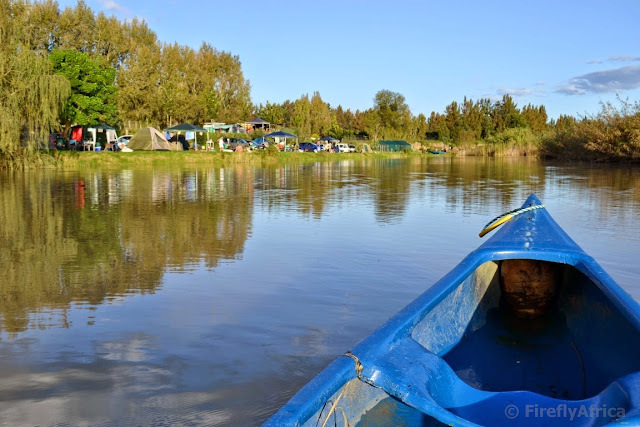 We are so fortunate that there are so many excellent camp sites all over South Africa where one can go and pitch a tent (or park your caravan) for a couple of days. Not just are there many in numbers but also many destinations. On the coast, in the mountains, in game reserves, along rivers, in small towns, next to dams and in desert areas just to name a few. Our last camping trip was at Sitrusoewer just outside Kirkwood in the Sundays River Valley. The campsite is situated on the banks of the Sundays River with campers fishing, swimming and canoeing all day long. 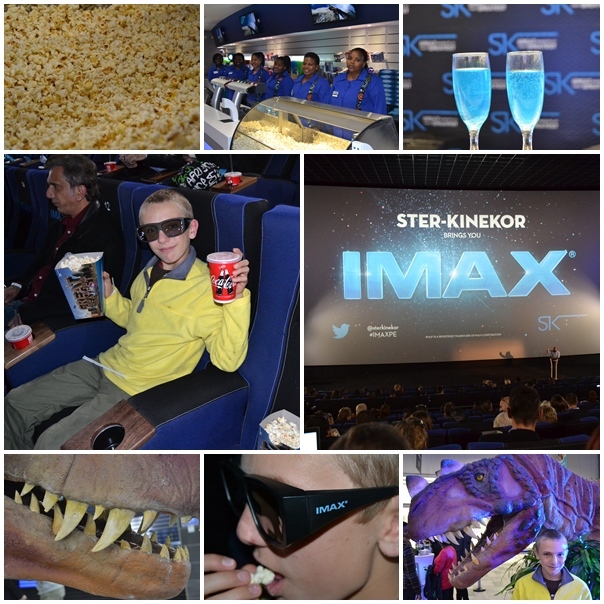 I have never been to an Imax movie so big was my excitement when I received an invitation from Ster-Kinekor to the grand opening of their brand new cinema complex at Baywest in Port Elizabeth. The complex is made up of 5 regular cinemas, two Cine Prestige luxury cinemas (kitted out with reclining chairs and the works) and, the cherry on top, an Imax cinema. Only the fourth one in South Africa. Did I mention that Joburg hasn't got an Imax yet. Cool, hey! Last night Chaos Boy and I headed over to Baywest Mall for some blue carpet treatment and joined celebs, business people, media and a dinosaur for some cocktails (Appletizer for Chaos Boy), snacks, one or two speeches, lots of photos and a screening of Jurassic World. Ja ja, ok, se we were basically there to see Jurassic World. But it wasn't sommer maar net watching another movie. This one was in the 330 seater Imax theatre, on a screen three story high, perfect surround sound and, wait for it.... in 3D. BOOOM! What an amazing experience! Imax in 3D may possibly have spoiled every other cinema out there for me. I may even have to go and throw out my old box tv and get a plasma just to increase screen size. The theatre complex officially opens today (Thursday 18 June) and those who have never had an Imax 3D experience before is truly in for a treat. In the last week or so I have seen a lot of people ask on Facebook what the cost of tickets are. The cost is R110 for adults and R75 for kids. Ster-Kinekor club members will pay R55 on Tuesdays while Discovery Vitality members with a Ster-Kinekor movie card will pay R66 any day. Edgars Club members pay R71.50. I already hear people moan about the cost of the tickets, but I'm sure those moaning are the same ones who always moan that there is nothing to do in Port Elizabeth and that nothing ever comes to the city. It's probably also people who have at some stage or another paid R750 to see an international act and traveled to Cape Town to go and watch them, paid R450 to watch a rugby test, thinks nothing to pay R130 for a bottle of brandy or go and sit in the Spur at least once a month forking out R500 or R600. Yes, it may be a little steep in a lot of people's language, but it's a treat like all of the above examples so there is no excuse to moan about the price. So now that we have that out the way, treat yourself and go and experience movies like they should be experienced. In 3D on an Imax screen. 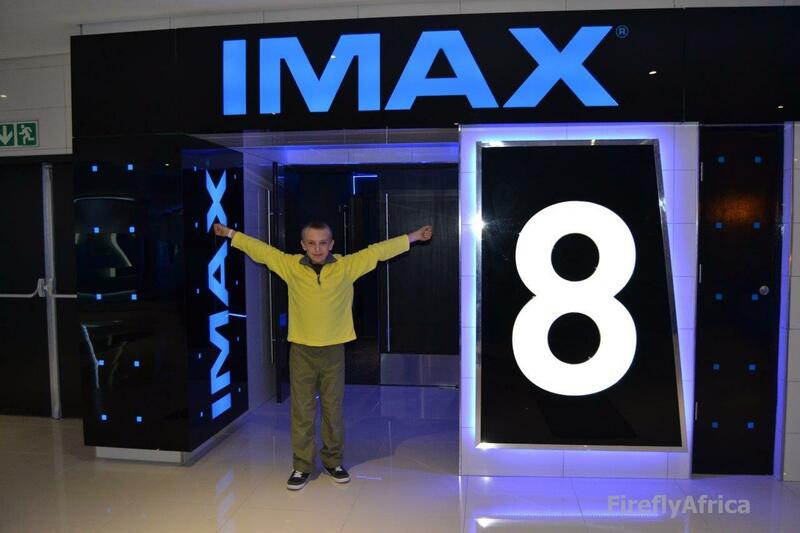 Disclosure: We attended the Imax grand opening as guests of Ster-Kinekor. I received no further remuneration, wasn't asked to write a positive post and keep full editorial control. 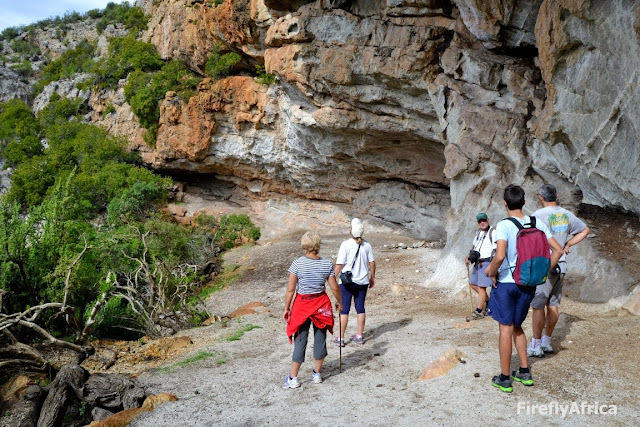 The Baviaanskloof is an UNESCO World Heritage Site representing the Cape Floral Kingdom but it could just as easily also have been one because of the KhoiSan history and heritage that is found here. Spending a relaxing weekend at Baviaans Lodge I learned that there is quite an important rock painting site on the property. The extra bonus was that Alan Fogarty of Alan Tours, probably one of the top nature guides in the Eastern Cape, was spending the weekend at the lodge as well and he offered to take us and a couple of other guests up for a look. After a bit of an adventurous ride on the back of Baviaans Lodge owner Rob le Roux's bakkie, we got to where we had to continue on foot. Alan led the way with the rest of us in tow. 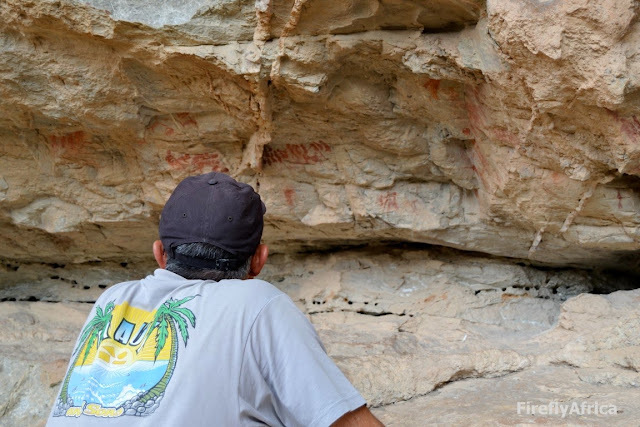 With Alan there it became so much more than just a hike to see rock paintings. 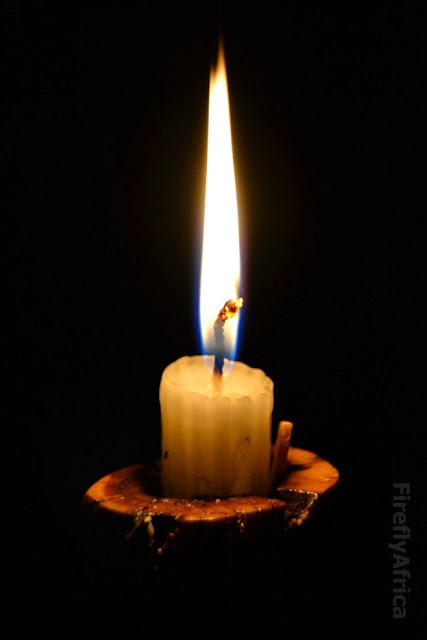 It became a real life moving lesson in nature and everything around us. I made sure that I walked at the back of the group as I kept stopping for photos. Plus I knew Alan would stop every few meters anyways and that he did, pointing out different plants and explaining their names and what they would have been used for. We crossed a stream a couple of times and Alan pointed out that there was a small herd of kudu on the trail in front of us. How did he know because we sure couldn't see them? 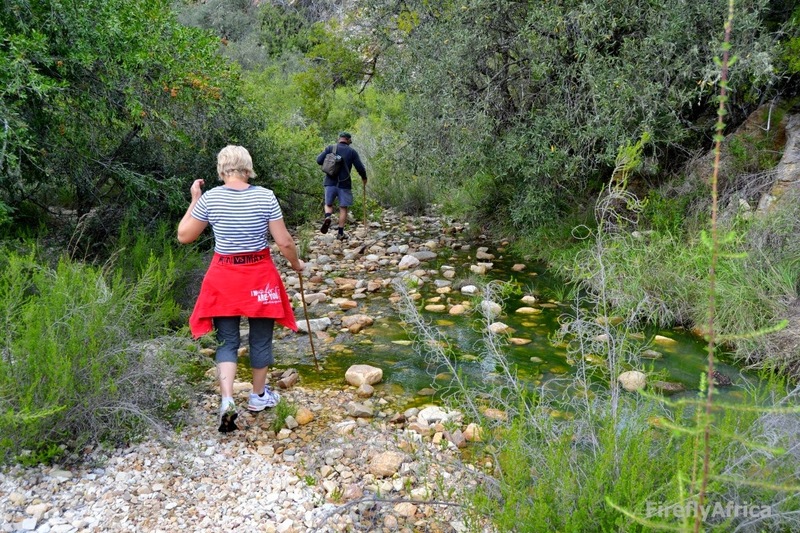 Each time we crossed the stream there were fresh tracks in the sand on the other side. 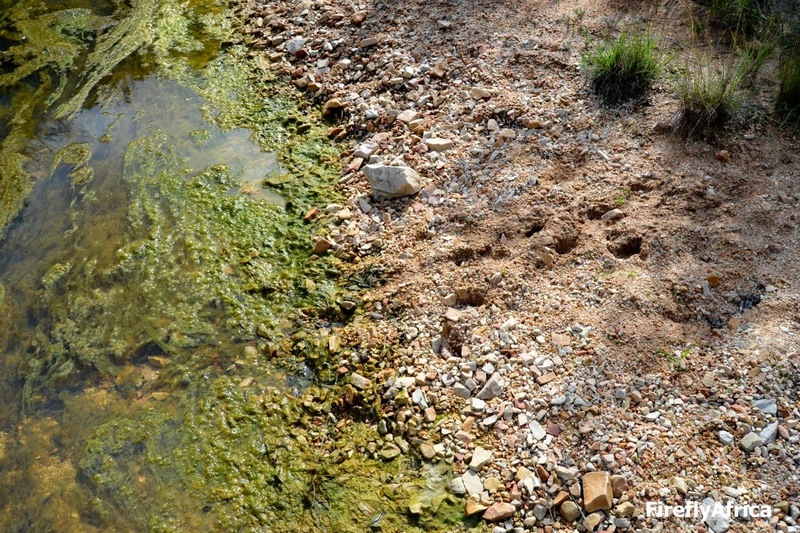 The proof that it was fresh was that the sand and rocks were wet from where they splashed through. At one stage we crossed over a rocky outcrop and Alan pointed out the ancient footpath over the rocks. A path carved out by human and animal feet over eons. I can't remember for the death of me what the pink flowers we found were but I don't know why some kind of wild orchid keeps popping into my head. Beautiful regardless of what they are called. After a steepish climb we got to the overhang, facing north and slightly sheltered from the prevailing westerly's. Wow, what a view but we were here for something more. 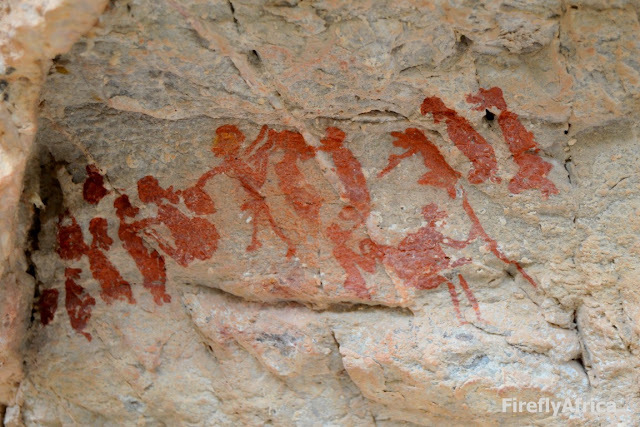 Rock paintings. The main rule when at such a site is NO TOUCHING! 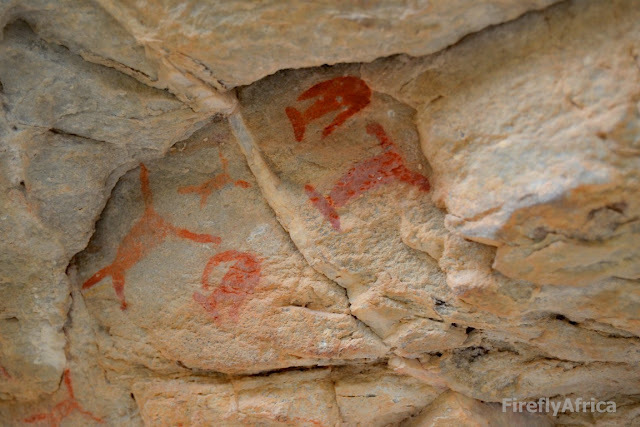 It is amazing how many rock art sites have all but been destroyed by people touching and even worse, adding their own graffiti to the rocks. 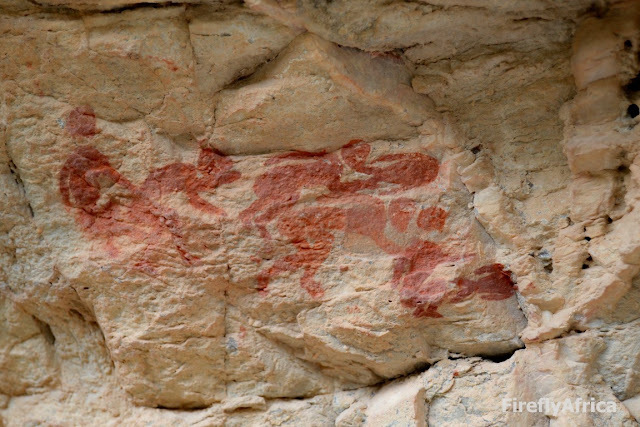 This site though is immaculate with the drawings easily accessible and visible. Alan explained what we were looking at but most of it is nothing more than guesses as it's often difficult to translate what the shaman would have been drawing while in trance. This specific drawing was very interesting. It looked like people coming out from behind a rock on the left and being met by other people. If you look at the faces of the characters it looks very much like those coming out have sad looks on their faces while those meeting them look happy. They also seem to be carrying bundles with them. Visitors from afar perhaps? This drawing, if I remember correct, was on the other side of the rock and showed human and fish characters entering a crack behind the rock. Probably one of the most interesting drawings is of this character which looks like it's wearing a cape. It also looks like he is shooting something, perhaps energy, from his hands or alternatively drawing it towards himself. The other paintings there were lots of were hands. Wish we could know more about these drawings and what they represented without just guessing. 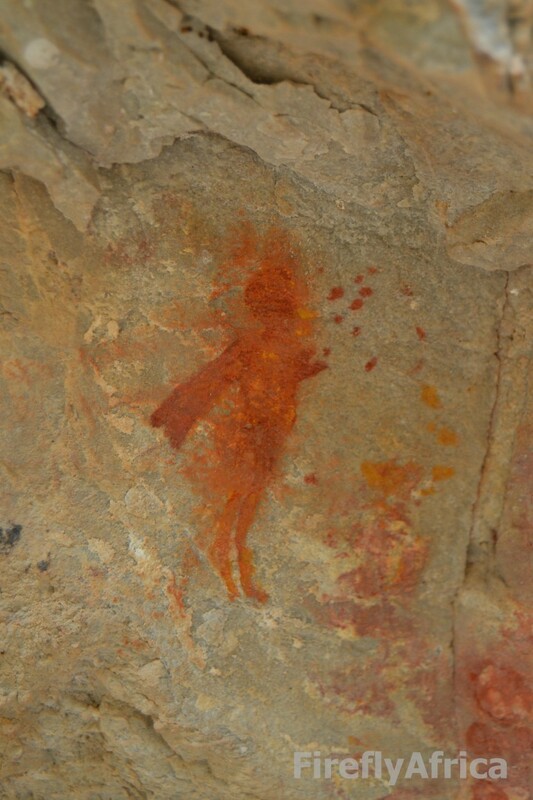 I'm sure there are a lot more to learn from sites like this throughout the Baviaanskloof. Interestingly, the only mummy every found in southern Africa was found not too far from here in 1999. The mummy, named Moses, was dated to be about 2000 years old. The male mummy is thought to be an ancestor of Khoisan people on the way it was buried.basis of the burial method. The stomach contents indicate that his last meal consisted of wax berry and honeybush. The find, although not as spectacular, are compared to some of the most important mummified finds in Egypt. I do believe that if there is one there would be more so one day there may be more significant finds to be made in those mountains. Makes me wonder what if I persuade wanting to me an archaeologist when I was younger. Disclosure: We enjoyed our visit and tour as guests of Baviaans Lodge and Alan Tours. I received no further remuneration, wasn't asked to write a positive post and keep full editorial control. If I had to show this photo to anybody and ask them where the picture was taken, they would probably guess places like the Tsitsikamma, Knysna forest or Hogsback. Although all of these are likely candidates, in all cases they would be wrong. 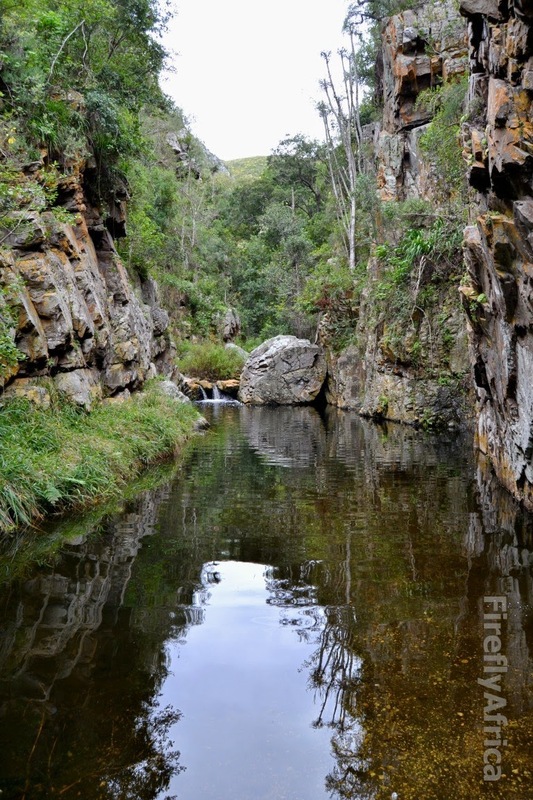 This specific scene is hidden away in a valley near Baviaans Lodge in the Baviaanskloof. 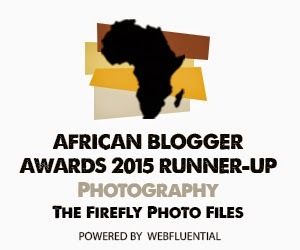 Since I started blogging nearly 7 years ago, the post that has received the most attention wasn't some exotic location, epic once in a lifetime animal photo or mind blowing sunset. 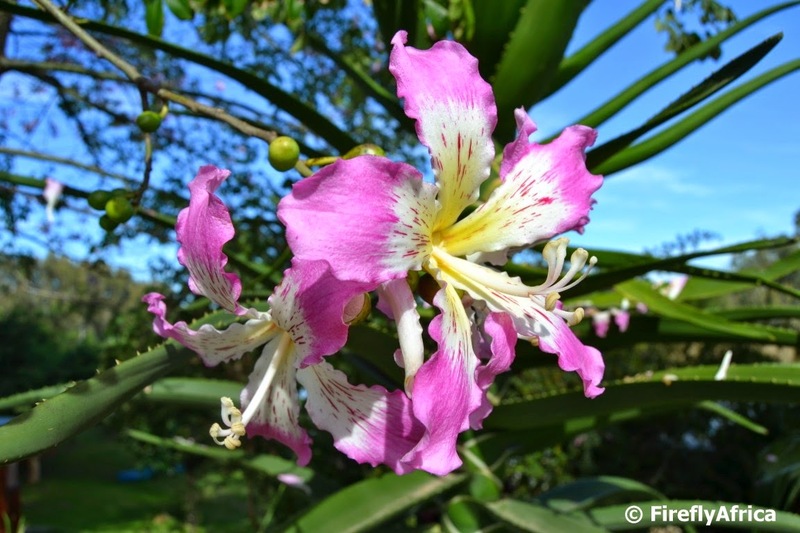 It was a post about a flowering Kapok Tree. Up to now it has received over a whopping 20 000 page views. I've been wanting to do another post but the problem was that I haven't had another chance of encountering one while it is in flower and having my camera on hand. A camping weekend at Sitrusoewer outside Kirkwood in the Eastern Cape was my chance. There were a couple of trees above the campsite and one afternoon I took my camera for a walk and snapped a few pics. Two trees with yellow flowers native to northern Australia and Papua New Guinea, the Cochlospermum gillivraei and the Cochlospermum fraseri. 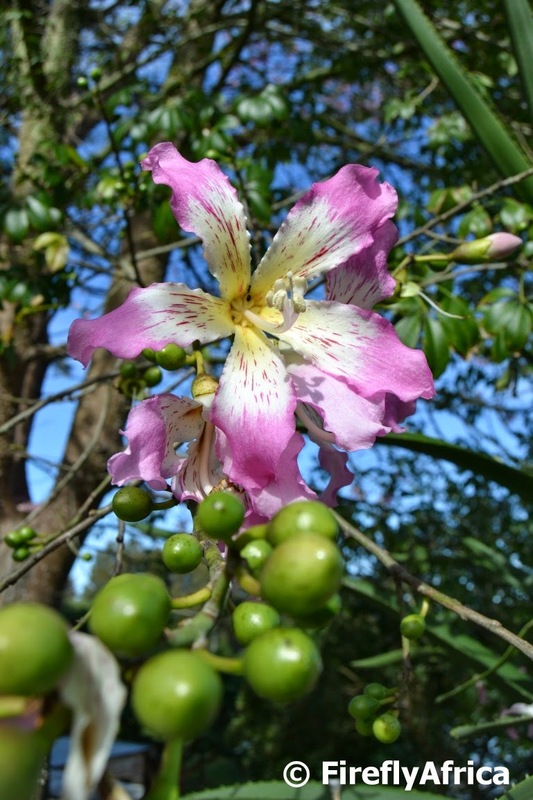 The tree in this post is a Chorisia speciosa of the family Bombacaceae (bombax or baobab Family). 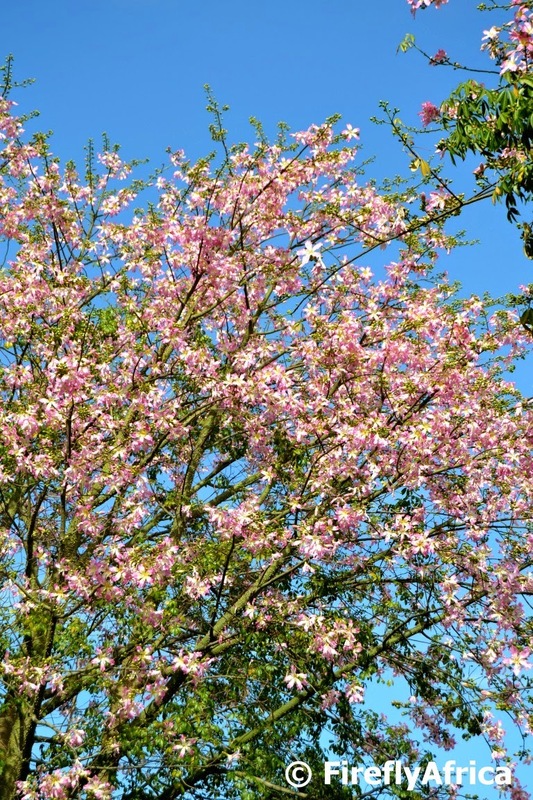 It's common name is a silk floss tree or kapok tree. 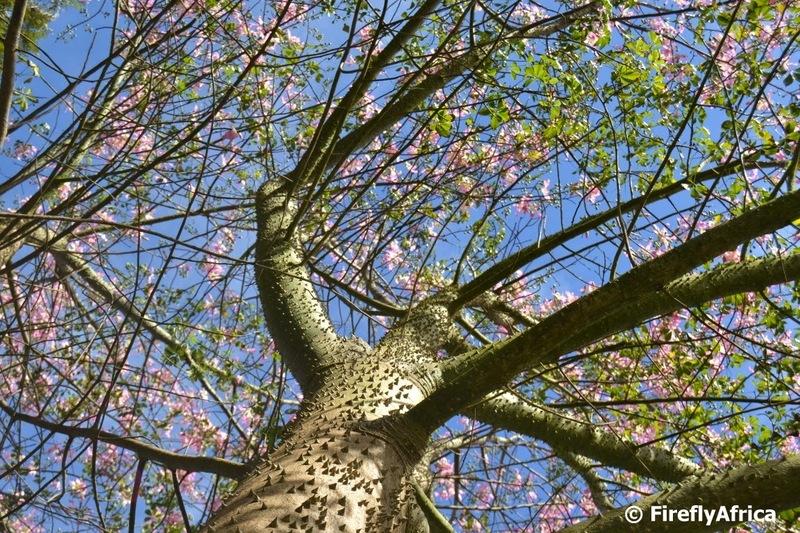 This Kapok tree is native to Argentina and Brazil but is grown in many tropical areas. It also grows well in parts of southern California and apparently, right here in South Africa. 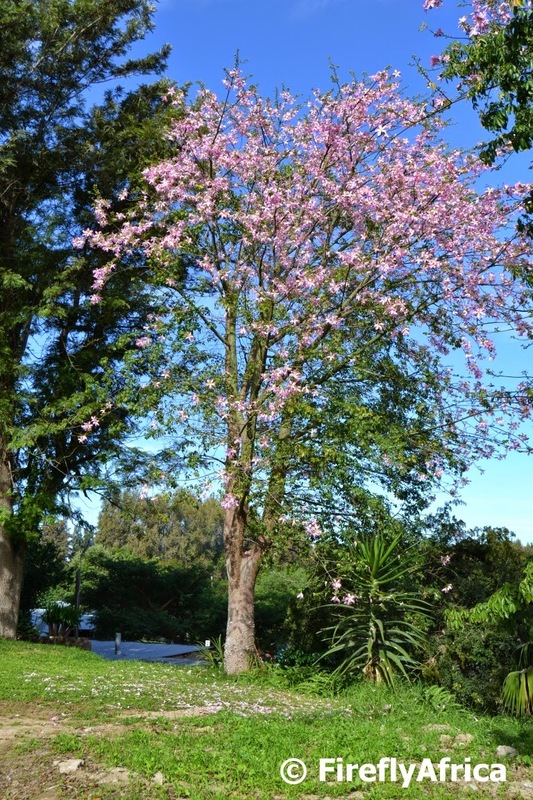 The tree (being an deciduous exotic to South Africa) drops its leaves just before they put on their spectacular autumn display of five-petaled flowers. The flowers vary from pale pink to rose, purple or burgundy at the tips and grade into a white or ivory. The flowers are then followed by pear shaped capsules filled with many seeds embedded in silky white floss. 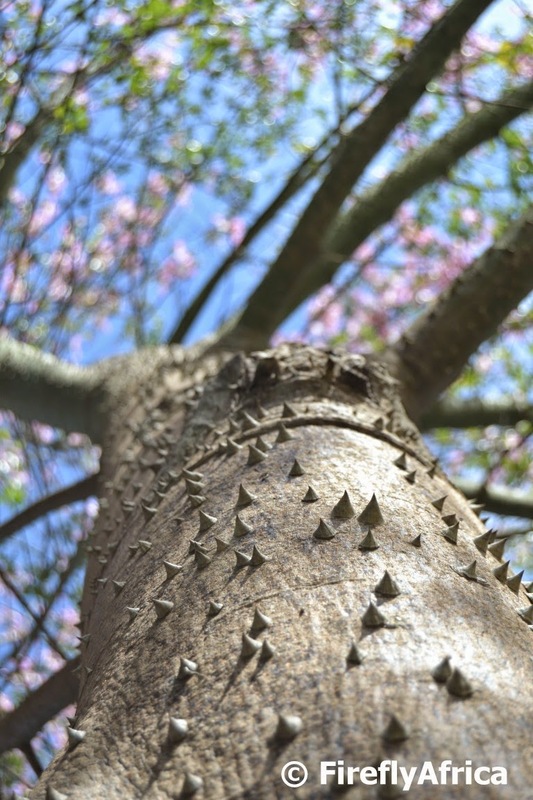 Hence the silk floss tree name. The tree's trunk is mostly green in colour and is covered with big warty triangular spines. These spines turn gray as the tree gets older and will put anybody off from trying to climb one without a ladder or proper protection. Not that you would really want to climb it for any reason. The tree has a straight trunk with an umbrella canopy. 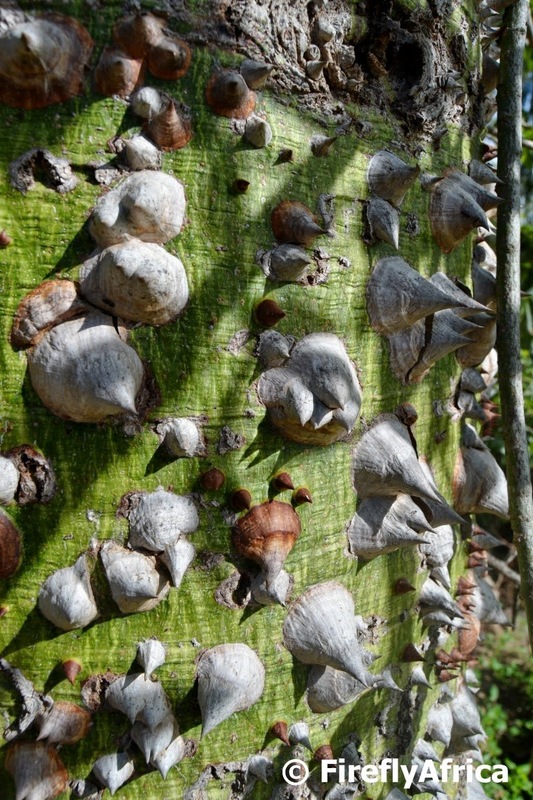 After my research I now also know a lot more about the Kapok / Silk Floss tree. In closing I just want to say, the tree may not really have any specific use, but it does make for a great conversation piece because of the spiny green trunk and beautiful flowers. Enough reason to want one in the garden. 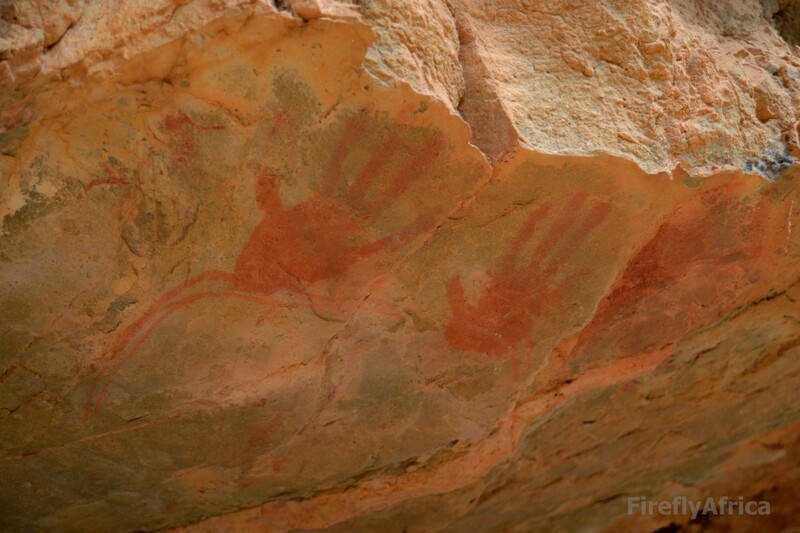 South Africa has eight UNESCO World Heritage sites. These are places such as a forest, mountain, lake, island, desert, monument, building, complex, or city that is listed by the United Nations Educational, Scientific and Cultural Organization (UNESCO) as of special cultural, natural or physical significance. One of the South African World Heritage Sites is the Cape Floral Kingdom. 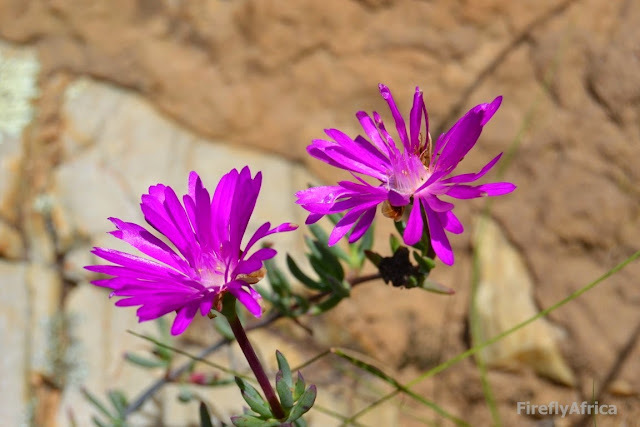 The Cape Floristic Region, the smallest of the six recognised floral kingdoms of the world, is home to more than 9 000 plant species of which 69 percent are endemic. Much of this is known as Fynbos. 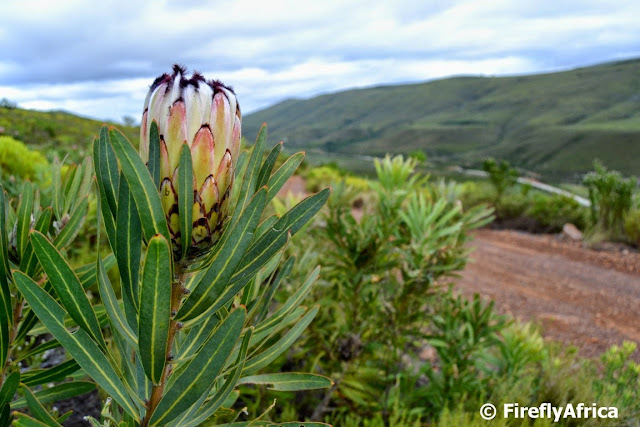 The Cape Floral Kingdom was named a UNESCO World Heritage Site in 2004 and eight protected areas in the Western and Eastern Cape were identified to represent this heritage site. The eight are Table Mountain National Park, Cederberg Wilderness Area, Groot Winterhoek Wilderness Area, Boland Mountain Complex (Limietberg Nature Reserve, Jonkershoek Nature Reserve, Assegaaibosch Nature Reserve, Hottentots Holland Nature Reserve, Kogelberg Nature Reserve), De Hoop Nature Reserve, Boosmansbos Wilderness Area, Swartberg Complex (Swartberg Nature Reserve, Gamkapoort Nature Reserve, Towerkop Nature Reserve) and off cause the Baviaanskloof Mega Reserve. 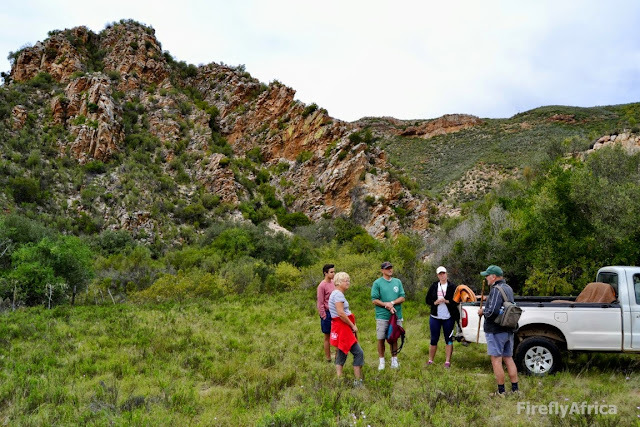 There is talk going around currently that the Southern Cape's Afromontane forests are being considered for inclusion in this site. 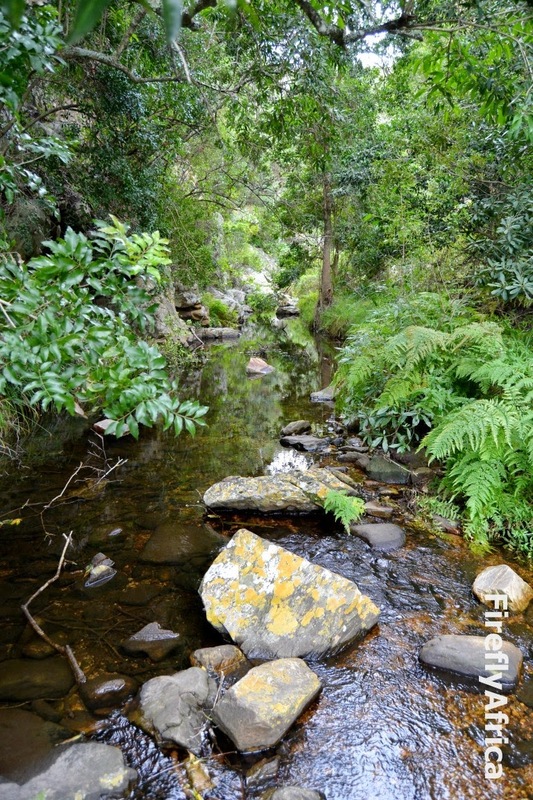 If it does get approved then a large part of the Garden Route National Park will then also be included in the site. 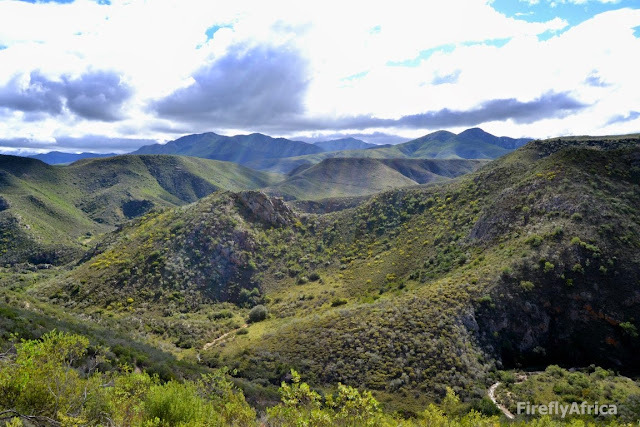 The Baviaanskloof Mega Reserve includes a cluster of formal protected areas totaling 500,000 hectares. Part of this is the 184 385 ha Baviaanskloof Nature Reserve - the third largest protected area in South Africa. The Mega Reserve also includes the Groendal Nature Reserve and Formosa Nature Reserve and encompasses private land mostly used for stock farming. One of the best parts of exploring while traveling is discovering hidden gems. Some of these hides are figuratively, as in somewhere (either a place or establishment) off the beaten track that the hordes haven't discovered yet. Sometimes you find places that are literally hidden though. 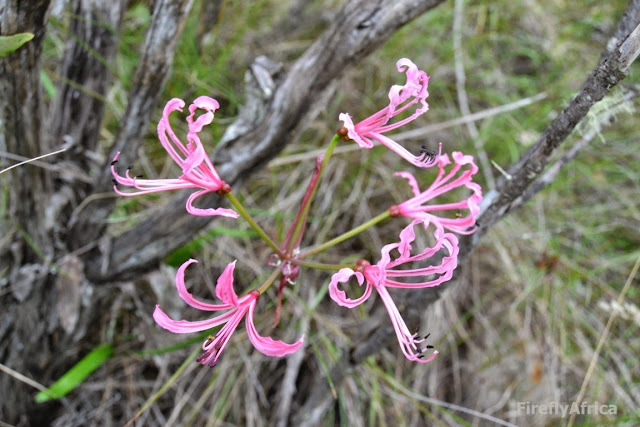 One of these I found on our weekend at Baviaans Lodge recently. A walk along a stream up one of the valleys near the lodge brought us to a breathtaking spot with a river pool, sheer cliffs on both sides and a small waterfall cascade. This is my kind of place. Somewhere to go and plug in your soul for some recharging. 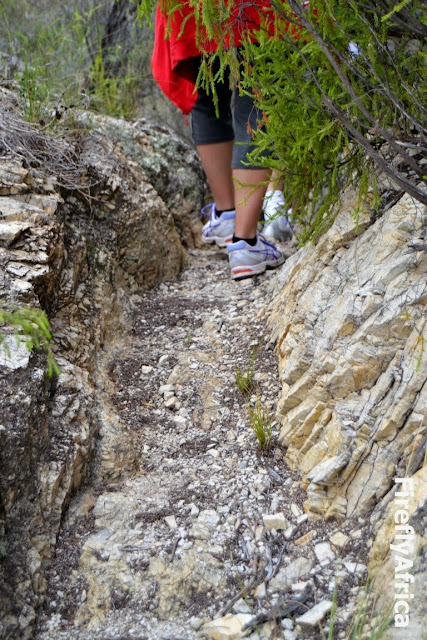 Do click through and read the whole post as Baviaans Lodge is the ideal recharging spot even if you don't walk up that valley.